Hi everyone, I’m Kendis, and I am privileged to be married to Kevin (a.k.a. Chaplain to Runners). It’s a privilege, but also an irony because I am not a runner. At best you would call me a “plodder”; at worst you would call me a sweaty snail. But I do get from point A to point B, it’s just not pretty or fast. That said, one of my favorite things is long runs (again, I must set the record straight and clarify that my long runs are 5 miles). I love long runs because Kev goes out first and then comes by to get me and we go together on his last leg. On long runs Kev always plots the course. He knows what I can handle and how far I can go, so I trust him and follow his lead. I trust him so much that when we cross the street I don’t even look back to check for cars. Why? Because I trust Kev to have my best interest and safety in mind. Christ also has my life course plotted out (Jeremiah 29:11-13), do I trust Him and follow His lead with the same faith and confidence? 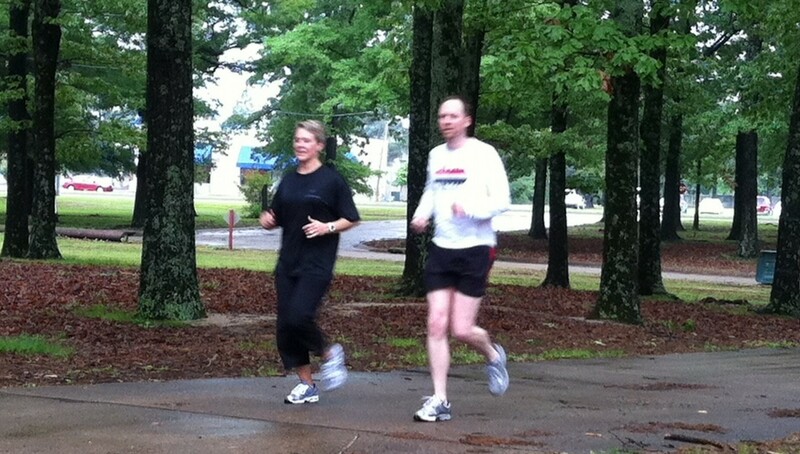 I really appreciate Kev allowing me to run with him. My pace is much slower than his, but he reminds me that long runs are not for time and speed but for endurance. So we go very slowly. Christ is never in a hurry, either. I often get so frustrated with my languid, limping pace (honestly, it’s often two steps forward, seven back), but Christ knows I am made of dust and He never condemns (Romans 8:1). Instead, He reminds me that my life race is a race of endurance and not speed, and He is completely committed to my race and will see me faithfully across the finish line at the perfect time! Finally, I relish long run days because I simply love spending time with Kev. He talks with me (I’m usually quiet and trying to conserve energy…hmmm there’s a lesson in that too), and we process life for an hour. How the Lord loves when we spend some time talking (and listening) with Him (Jeremiah 33:3). Nothing grandiose, just processing life. Aren’t you grateful Christ is your running partner? I am. And I am going to remember to follow HIS lead, trust His pace, and enjoy His companionship.